Have some sympathy for Eastern Orthodox Christian churches seeking to retain their members and even grow in an era when fewer people are affiliating with denominations. Many of their churches are small – the median number of active members in a parish is 100 – and lack the resources to offer a wide range of programming and services to compete with large congregations. And many Orthodox parishes remain congregations that emphasize ethnic culture and use non-English languages. This is especially true for Romanian, Serbian and Greek churches. Focusing church activities on ethnic culture can make newcomers feel like outsiders. It also limits the ability to hold on to succeeding generations, many of whom no longer speak the language of their parents or grandparents and marry spouses of a different faith or culture. In communities with just one Orthodox church, this also is an obstacle to attracting members of other Orthodox traditions. But even as today’s environment calls on all houses of worship to be more creative in reaching new generations, Eastern Orthodox Christian churches seem particularly resistant. It is not as if congregational leaders do not recognize the necessity for change. In a major new study, 7 percent of parishes reported things are fine just the way they are. •	Thirty-nine percent of parishes reported they were making the necessary changes to ensure a bright future for the congregation. •	Thirty-two percent of parishes said they need to change to increase their vitality and viability, but the parish does not seem to realize it or does not want to make the necessary changes. The top two obstacles to change? More than half of parishes reported a lack of resources, particularly energy and finances. Forty-four percent said their congregations lacked a unifying vision or direction. The unresolved stresses on congregations are taking a toll. Three in ten Orthodox congregations reported either their future was very uncertain, or that they are struggling, and their struggles are likely to continue. Less than a quarter of parishes said they are flourishing. Further, nearly three-quarters of parishes reported they experienced disagreements or conflicts in the past five years. By comparison, the report noted, 57 percent of evangelical congregations reported conflict over the same period. 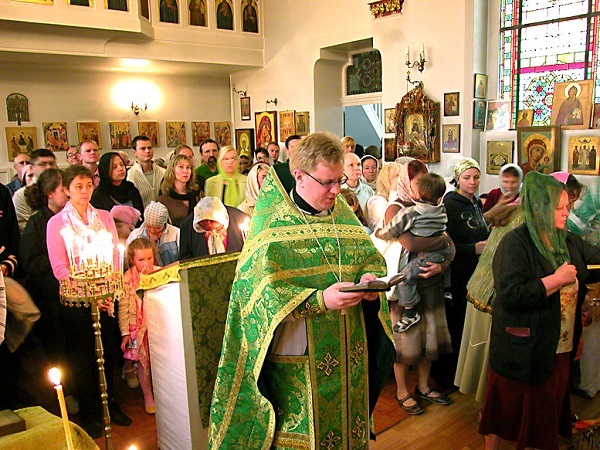 The study of ʺOrthodox Christian Churches in 21st Century Americaʺ was done by an online survey completed by a key informant, typically the parish priest. Thirty percent of parishes, a total of 580, participated. The research was part of the larger Faith Communities Today study of U.S. congregations. There was good news. The study also revealed several strengths of Orthodox Christian parishes in the U.S., Krindatch noted. Awe-inspiring worship: Nearly nine in ten congregations said their Sunday services very or quite well conveyed reverence. Eighty-four percent said the services were similarly filled with a sense of God’s presence. An embrace of technology: A majority of parish priests are “intense users” of electronic technologies and social media, the report stated. More than seven in 10 American Orthodox churches have both a conventional website and a more ʺinsider oriented” Facebook page. Just 3 percent have neither a website nor a Facebook page. Still, just 23 percent of congregations reported they were vibrant and flourishing. And many churches expressed little enthusiasm for evangelism or changing to meet the need of members. Parishioners take seriously the need to bring in new members in only 18 percent of American Orthodox congregations, parish clergy reported. In nearly half of the parishes, current members are only “a little or not at all” interested in finding and bringing in new members. This lack of interest in change and growth was particularly evident in their approach to young adults. The report noted that while people ages 18 to 34 make up about 23 percent of the U.S. population, just 12 percent of active Orthodox church members are young adults. Yet just 15 percent of parishes said young adult ministry was one of their top priorities. An earlier report from this study focused on young adults suggested that there are several things parishes can do to attract young adults. They include designating a young adult ministry leader, offering prayer groups and other opportunities for spiritual growth and generally making liturgies more joyful and inspirational, Krindatch said. But clergy said the No. 1 problem in reaching young adults is their lack of interest. That approach, rather than focusing on how parishes can improve their outreach, can be self-defeating.